Do You Feel Down Or Have The Blues Sometimes? Are You Feeling Really Stressed? Weather you answered "yes" to the above questions, or just want a change of scenery… break away from your life for a while with a Joy Ride and let the wind blow through your hair... leaving your troubles behind. If you answered "yes" to some of these questions, then you may suffer from the blues and La Dolce Vita Foundation can help you by taking you on a wonderful 'Joy Ride'. Blues Cruise - Driving You Sane! To the Italians, ‘La Dolce Vita’ means "the Sweet Life". It is our belief that the foundations of our daily lives should be of the highest quality. Thus we grant the ultimate ‘Joy Ride’ in a classic exotic roadster for children, teens or adult passengers who want to drive their blues away. Our current convertible roadster is a privately owned Black & Tan - 1993 MX-5 Mazda Miata --La Dolce Vita Edition. It is reminiscent of the 50-60’s classic Italian/English convertible sports cars: Fiat Barchetta, Alfa Romero Spider, Maserati, Ferrari, Lotus and Jaguar. This custom automobile envelopes the patient physically and emotionally to deliver the light, nimble, quick essence of a roadster experience. The primary ingredient in a 'Joy Ride', windinyourhair, is an effective treatment for the blues. Clinical research shows that windinyourhair relieves the blues as effectively as many prescription medications, but causes far fewer side effects. In fact, over 90% of 'Joy Ride' passengers with the blues and 88% with anxiety report positive results. Since a 'Joy Ride' is a natural supplement, you can apply for a test drive without a prescription. Please take a moment to read more below of how we plan to break your 'Blues' with a 'Joy Ride' . You can also find out how a 'Joy Ride' works or learn more about a 'Joy Rides' 100% natural formula. Founder michéal Castaldo says... "I truly enjoy taking friends and family, including some cancer survivor patients on short ‘Joy Rides’ in my Miata. 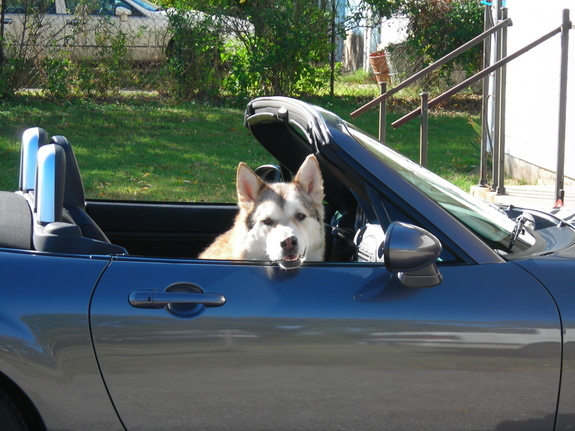 After seeing all the joy and bliss it brought to my aunt Rita Genua, a breast cancer survivor and my very good friend Ann Ruckert, an ovarian cancer survivor, I felt strongly that the selfish act of owning and driving a two seat convertible roadster absolutely had to be shared with others less fortunate in health. For the Joy Ride of a life time to be profound and impact lives, it must be shared. The original owner of the 1993 Miata was a doctor. He maintained and babied the car, thus all service records were kept on file. The second owner was a teacher and the Miata was a daily driver for him. The car was somewhat neglected and many dings and scratches were found on the body when it was purchased. In July 2005 my step daughter Ania and her husband Slawek wanted help in purchasing their first car. They decided they wanted a convertible...of which I was totally against because I thought it was an impractical car to own in NYC. Once they convinced me that they weren't planning to start a family for a least a couple of years and that this was the time for them to enjoy a fun car, I gave them my blessing and along we went searching for this fun car. Well low and behold Ania and Slawek cam upon the Miata that the teacher was selling. That summer we took occasional turns driving each others cars...and I became hooked on what a fun car the Miata was to drive. In May 2006 Ania and Slawek decided it was time for a more practical car and thus I made them an offer to take over ownership and began the obsessive summer project to customize the Miata with over 90 modifications to create a true show quality car. All the possible amenities and performance options have been added to increase safety, comfort and styling. It definitely is a ‘One of a Kind’ Miata now for our select patients to enjoy and brag about." La Dolce Vita Foundation grants ‘Joy Rides’ to under privileged youth or adults that last 1-4 hours. The passenger has a choice of bringing several CD’s (or I-Pod) of his/her favorite music, to have a conversation about any topic they choose or simply sit back and let the wind blow through their hair. A sophisticated video system (just like the kind in NASCAR racing cars, TV shows and films) will video tape the entire trip inside/outside the car. We will provide a DVD as a souvenir memento at the end of the ‘Joy Ride’ experience. At the beginning and end of the drive we will take digital photos to capture the excitement and bliss you’ll feel out on the open road. We have sponsorship relationships with great restaurants at the end of each destination that will provide a complimentary lunch/brunch for the passenger. To ensure the passengers safety, our driver is trained in CPR. He will always have a cell phone and GPS on board. All the medical emergency offices and hospitals on route of the various scenic drives are known to the driver. La Dolce Vita Foundation hopes to provide access to the love affair that Americans have had with automobiles, freedom of travel and taking in the natural beauty of their surroundings. Contact us to set up an appointment for an evaluation if you qualify. • We'll plan an extensive outreach to the community for sponsorship from November 2007 to April 2008. • We'll plan to obtain professional quality first aid kits, defibrillator, sanitized seat covers and surgical gloves. • We'll hope to get celebrity auto enthusiasts, such as, Jay Leno, Jerry Sienfeld, Reggie Jackson and David Letterman to donate their cars and driving skills for all patients to enjoy! To view a PDF file of our brochure please click here. The Following Are Companies That We Love, Because They Help Us Keep Our Operational & Production Costs To A Minimum Either Through Partial Sponsorship Or Reduced Fees. If You Have A Service Or Product That Can Be Useful To Our Joyride... Please Contact Us. To learn more about the founder view this PDF photo and Bio here. Involuntary Grinning, And Feelings Of Oneness And Exhilaration. Consult Your Therapist/Clinician If A ‘Joy Ride’ Is Right For You.